As businesses go digital, technology expertise is needed more than ever. The question is how to do that in a way that doesn't alienate the business. CIOs can stop apologizing for their technology know-how. As business users become more technology-savvy, IT expertise is needed more than ever to ensure business success. 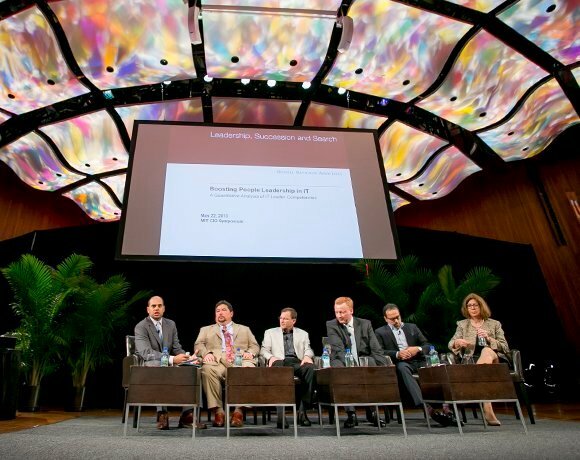 That was the message delivered by five CIOs from SAS Institute Inc., EMC Corp., SAP AG, Avaya Inc. and J&J Pharmaceuticals during a panel discussion at the recent MIT Sloan CIO Symposium. Moderated by Shawn Banerji, managing director at New York-based consultancy Russell Reynolds Associates, panelists waded into how big data, better technology and growing customer demands are creating new challenges that have to be met head-on, right alongside their traditional duties. "The reality is," Banerji said, "the new paradigm for CIO responsibility is being able to do all of the old things superlatively, plus take on all of these rapidly evolving demands and challenges." In this first installment of a two-part series, SearchCIO focuses on how to mine new opportunities out of IT's more functional responsibilities. Even with the push to be more cutting-edge and agile, companies depend on CIOs to keep the lights on. "Forget the innovation discussion," said Michael Golz, senior vice president and CIO of SAP's Americas division headquartered in Newtown Square, Pa. "If email is down, it just doesn't happen anymore." IT departments are, in other words, like digital carpenters: When the network breaks, IT is there to fix it -- a part of the job description that can sometimes be taken for granted. What we in IT can bring is not only an understanding of how technology can be used, but how it actually works. Today's business users, it is true, are more technologically savvy and face more opportunities to purchase easier-to-use products or services without IT's nod of approval (or nod of any kind, for that matter), panelists said. Yet purchasing Software-as-a-Service tools or buying Salesforce.com user licenses doesn't obviate the need for the IT basics: data quality, systems maintenance and data integration. "The conversation that's being left out in most of those acquisitions by the business units is who is going to collect that data to get it back in to have a holistic view of the organization," said Keith Collins, senior vice president, CTO and CIO at Cary, N.C.-based SAS Institute Inc. The key, Collins said, is for CIOs to leverage what their departments are already good at doing. "I think there's going to be this huge opportunity around technology and master data management to bring together all of these different systems that are now on the outside of your arena," he said. Eradicating shadow IT is neither possible nor desirable. And in some respects, it only underscores the need for IT expertise, Collins said. CIOs can help provide a perspective on the techy side of the purchase that might not be considered otherwise. "My colleagues inside the business have a good understanding of how the technology can be used. What we in IT can bring is not only an understanding of how technology can be used, but how it actually works," said Georgia Papathomas, vice president and CIO at J&J Pharmaceuticals headquartered in New Brunswick, N.J. While IT has a unique perspective to offer, the question, raised by SAP's Golz, is how the department can convince the company its perspective belongs at the strategy table. He suggested taking the initiative to dream up and then execute on products for the highest level of executives on a very small scale. Not only does this give the department visibility, it also illustrates how IT is thinking proactively. Michael Loo, vice president of global IT, Avaya Inc.
Keith Collins, CIO, CTO, senior vice president, SAS Institute Inc.
Sanjay Mirchandani, former CIO, executive vice president, EMC Corp.
Golz did just that by handing over a mobile analytics tool that could potentially enable a real-time forecast for sales to the board member in charge of that department. "That created a total wildfire and also generated something that was kind of like a self-funding project," he said. "We didn't have to ask for money, because it was just a 'This is great; let's push this out; this provides value.' It was not something that was initially thought of by the business." CIOs can help their staff develop that kind of creative thinking for out-of-the-box projects. J&J's Papathomas, for one, directs her employees to schedule two hours per week to research what's in, what's out and what others (trailblazers, competitors and beyond) are doing with technology. "We can [then] initiate the conversation with the business as to why this new, cool application is the right one," she said. "We are the ones who start the conversation, rather than the business." Of course many CIOs have earned a seat at their companies' so-called "tables." What's interesting, according to Russell Reynolds' Banerji, is that the CIO perspective in increasingly being recruited by outside boards of directors. He noted that in the last 18 months, there's been an uptick of CIOs approached to serve on public company boards -- something that was virtually unheard of before. It's a positive trend for CIOs, and to keep that momentum going, they need to encourage and empower their IT staffs to be just as savvy about working with the business, panelists said. "I always say there's no such thing as an IT standard," Papathomas said. "There's only a business standard and an IT roadmap." Read the second installment on teaching your IT staff the language of business. What kinds of innovative projects have you been able to work on as an IT professional?